Pic An icy shell around Saturn's largest moon Titan is thicker and tougher than boffins previously thought – and it is concealing a bizarre interior with inward-facing spikes. NASA's Cassini space probe buzzed the mysterious heavenly body in February to scan its gravity field. Now researchers, who are poring over the collected data, have theorised that the ice surrounding the moon is likely rigid, with frozen roots jutting through the underlying hidden ocean. Sensor readings from small peaks on the landscape led planetary scientists Douglas Hemingway and Francis Nimmo from the University of California, Santa Cruz to believe that the shell has inner spikes extending into the moon's interior. "Normally, if you fly over a mountain, you expect to see an increase in gravity due to the extra mass of the mountain," said Nimmo, a Cassini project scientist. 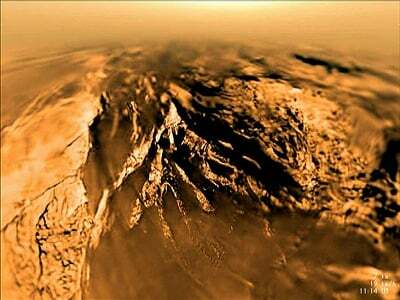 "On Titan, when you fly over a mountain, the gravity gets lower. That's a very odd observation." The explanation for this gravity shift could be that each mountain is actually the top of these deep roots, which are like icebergs pushing into the interior oceans. Cassini detected a weaker gravitational force because ice is slightly less dense than water (which means, in a given space, there's less mass and therefore less gravitational pull). "It's like a big beach ball under the ice sheet pushing up on it, and the only way to keep it submerged is if the ice sheet is strong," said Cassini team associate Hemingway, who was lead author on a paper about the findings. "If large roots under the ice shell are the explanation, this means that Titan's ice shell must have a very thick rigid layer." If the boffins are correct, that means that the tough layer is unlikely to have ice volcanoes, which other scientists have theorised could be responsible for other features on Titan.